US President Donald Trump touched down at London’s Stansted Airport on Thursday to begin a long-planned visit to the UK. During his three-day trip Trump will meet with UK Prime Minister Theresa May and the Queen. The visit is expected to be marked with large-scale protests across the country and comes after Trump took a harsh stance on the United States’ European allies during a NATO summit in Brussels. Last year, Trump cancelled a similar visit to the UK, during which he had been expected to open a new US embassy in London. US Secretary of State Mike Pompeo called his Russian counterpart Sergey Lavrov to discuss the upcoming meeting between US President Donald Trump and Russian President Vladimir Putin in Helsinki next week, the US State Department said in a statement. The two diplomats also talked about Syria and North Korea, the statement said. Trump and Putin are to have their first dedicated face-to-face in the Finnish capital on Monday next week. 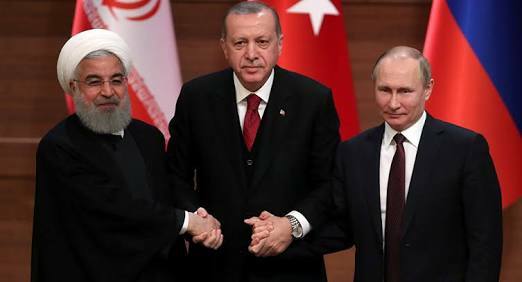 Russian President Vladimir Putin and his Turkish and Iranian counterparts, Recep Tayyip Erdogan and Hassan Rouhani, are to meet in Tehran to discuss Syria, senior aide to Iran’s Supreme Leader Ayatollah Ali Khamenei says. Khamenei’s top adviser, Ali Akbar Velayati, met the Russian leader on Thursday in Moscow. He delivered messages from Khamenei and from President Hassan Rouhani to Putin. During the “constructive, clear and friendly” two-hour dialogue, the two discussed Iranian-Russian cooperation, including in Syria. “Putin said that he will go to Tehran soon to take part in [Turkey-Iran-Russia] meeting on Syria,” the aide said. The latest trilateral talks on the crisis in the Arab Republic were hosted by Turkey in April. Emmanuel Macron will have a meeting with Vladimir Putin when the French president attends the FIFA World Cup finals in Russia, Media said citing a French official.Signals of a possible meeting have also been coming from Kremlin sources on Wednesday. Macron watched the French team beat Belgium in St. Petersburg on Tuesday. The match for the champion title will take place in Moscow on Sunday, in which France will be pitted against either England or Croatia. The French president made an official visit to Russia in May to attend the St. Petersburg International Economic Forum. Relations between Macron and Putin got off to a rough start last year, with the French president accusing Russia of trying to undermine his campaign with ‘fake news’ during Putin’s visit to France. But Macron’s visit this year seemed generally warm and was marked by a number of high profile business deals signed by Russian and French firms, as well as both governments.